Virus hoaxes are fake virus reports resembling the chain letters of yesteryear. 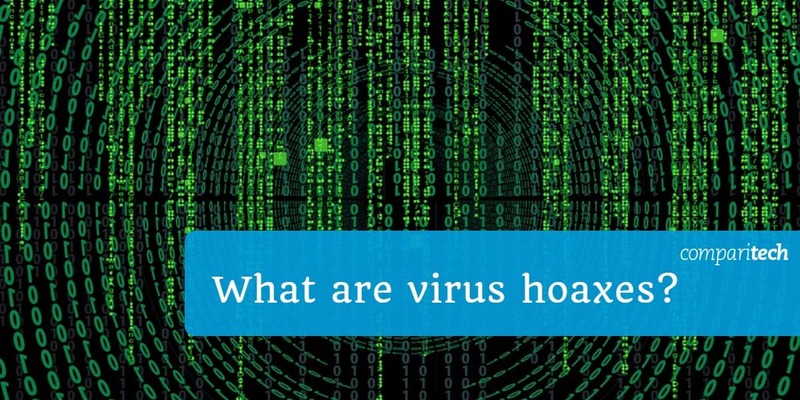 Virus hoaxes are threatening and scaremongering, unlike those old chain letters, which promised all sorts of luck and oodles of cash if you forwarded the letter to X number of people. Unlike viruses, virus hoaxes do not self-replicate. People who forward them on are either fooled by the threats and (helpfully) want to warn others, or have a knee-jerk reaction to share anything unusual in their inbox. How does a virus hoax start and spread? Typically, a virus hoax starts as a single email or message sent randomly to individuals, is shared via an organization’s internal network, is forwarded through a messaging app like Whatsapp, or is posted on social media like Facebook. Because of its alarming content, well-meaning recipients forward it to friends, family, and colleagues, who in turn forward it to their friends, family, and colleagues. Well-meaning friends, family, and colleagues, create their own versions of the message and post it on social media and share it in their IM groups. Sometimes, like Chinese whispers, the message is distorted, making it difficult to pinpoint the origin of the message and whether there is any conceivable truth in it. The first documented virus hoax was the 2400 Baud Modem Virus in 1988. The Good Time virus hoax, discovered in 1988, was one of the most “successful” ever, rearing its ugly head regularly, and instigating a number of similar hoaxes, including the satirical Bad Times virus hoax. The sulfnbx.exe (2001) was typical of more harmful virus hoaxes, using social engineering techniques to panic message recipients into acting without thinking, in this case, deleting legitimate files. Virus hoaxes are supposedly harmless. Or, are they? Early hoax viruses used a lot of bandwidth, wasted people’s time (at some cost to businesses), and caused a great deal of anxiousness and fear, for home users in particular. In the early-2000s, what had been a prank or joke, evolved into something more sinister. For instance, hoax virus messages provoked users to delete files, supposedly viruses, unnecessarily. Today, hoax virus messages are disseminated on social media networks, ideal platforms for wide-spread scaremongering. A new entity is evolving – what one may call the virus hoax hybrid. It is developing new potentialities, e.g. host to real malware, marketing tool, automated troll, and Trojan behavior. Let’s look at some examples of how some virus hoaxes are shape-shifting. Irina (1996) – There have been a few cases where otherwise reputable firms irresponsibly used virus hoaxes in publicity stunts. Irina was, according to researcher Graham Cluley, a publicity stunt for a book, Irina, published by Penguin. Red Team virus (1998) – Real viruses may masquerade as virus hoaxes. The Red Team virus message included an attachment to what appeared to be a virus hoax alert. The notification claimed the .exe file was an antidote to Red Team. Mail Report Server (2006) – Typical virus hoaxes are harmless. However, there is a risk the original sender, on an attention-seeking high, could attach a real virus in a follow-up hoax. May God always bless (2011) – Traditionally circulated by email, virus hoaxes today spread at a rapid rate via social media and messaging apps. The old Olympic torch invitation virus hoax, for instance, made an appearance on Facebook some five years after the original email version. Facebook is the ideal environment to spread virus hoaxes. It’s gratifyingly instant (to provoke and receive responses); allows text formatting, eye-catching emojis, and graphics to decorate; pretty much guarantees likes and shares; and is a 24/7 medium (someone, somewhere in the world, will always be awake.) In fact, Facebook sort of blames its Bold Text feature for the May God always bless virus hoax. Variations on the Linda Smith / Jason Lee virus hoax threaten to subvert what ordinary people think of Facebook as a safe digital neighborhood to meet with family and connect in their online communities. Users‘ imaginings are beginning to see it as littered with virtual discarded syringes. When revealed as hoaxes, people who have (in all good faith and innocence) passed on virus messages may feel embarrassed about being taken in. Virus hoaxes can promote mockery and shaming by peers via posts like the stupidity virus. The virus hoaxes listed here were sourced primarily from the following websites. Sometimes more than one resource was used to verify discovery dates; in some cases, the discovery date is simply the first mention made of it on the internet found. The first two entries, in particular, have comprehensive alphabetized lists of virus hoaxes. You should verify a suspicious email about a virus before acting on it. You can use the links above on the virus hoax list in this article. Never forward a virus hoax message, however tempting it may be to share something you find amusing with friends. Sharing virus hoaxes clogs internet servers (inevitably, if everyone does it, your machine will also be affected), and puts your contacts at risk. Virus alerts from genuine sources never ask their customers or the general public to forward messages; they are perfectly capable of spreading the message themselves. If the message is a virus hoax, do not reply to the message or forward it to anyone. Delete the message. If the message is notification of a real virus, you do not need to reply to the sender. If you feel the need to pass the warning on to friends or family, include a link to the web page where you verified the virus is real. In all cases, do not under any circumstances open any attachments or follow any links. As we have seen, there are cases where viruses masquerade as virus hoaxes and may be dangerous. On social media, never post a message about a virus hoax you have received. Virus hoaxes on Facebook often ask people to copy and paste messages on their own timelines. This helps to keep the hoax fresh and hide the identity of the original sender.